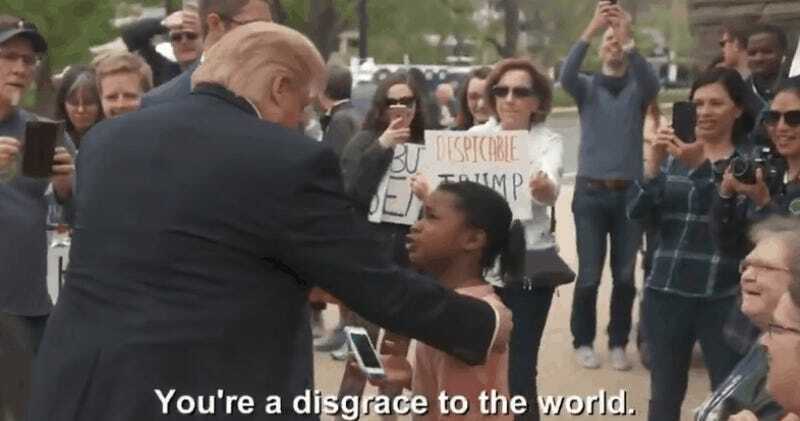 Have you seen that video of a young girl telling President Trump that he’s “a disgrace to the world”? It’s a satisfying clip for those who believe the president needs to be called out to his face. But the video is completely fake. The clip went viral on Twitter yesterday, with countless people believing it was a young girl speaking truth to the most powerful man in the world. But the clip is actually from a Comedy Central series called “The President Show” starring Trump impersonator Anthony Atamanuik. The show debuted last month and airs on Thursdays after the Daily Show. The clip that has gone viral is embedded below. As you can see, it’s cropped so that the Comedy Central logo has been cut out. As you can see from the original video, the Trump is clearly fake, and even agrees with the young girl that he’s a disgrace. There’s some question as to whether the young girl’s response is genuine, but the way in which everything is set up, she could very well be an actor herself. Atamanuik is a decent Trump impersonator, but it’s hard to believe that anyone who’s up close to the man really thinks it’s him. If you take a look at his face, he’s clearly not President Trump. Twitter user najahtaa, who captioned the video “who is she,” has racked up over 150,000 retweets and 220,000 likes so far and clearly has no intention of pulling it, despite the fact that’s it’s being passed around as real. Even though it’s fake, many people on social media don’t seem to care, which certainly speaks to the fact that lefties just want a win—any win, really. The little girl said what so many people want to say to the real Donald Trump. But for the time being it seems that no one is going to get the chance to tell Trump that he’s a disgrace. Unless his favorite show, Fox & Friends, takes a really weird turn. Update, 8:22am: The actor who plays Trump on the show, Anthony Atamanuik, claims that the little girl wasn’t an actor, which very well could be accurate. But Atamanuik also claims that no one “faked” anything. He literally fakes playing the president.